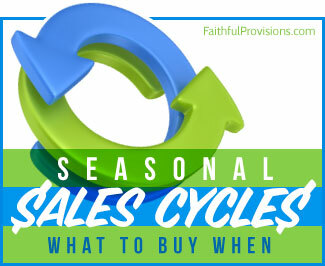 After all the great deals and stocking up this week I realized I needed some prep time to get everything properly stored to use later. We love to make smoothies, so I stocked up on strawberries and bananas while they were on sale and grabbed some great prices on whole wheat bread rolls. First, I just took the bread and put them into freezer gallon bags and labeled them. I was sure to squeeze as much of the air out so not to get freezer burn. 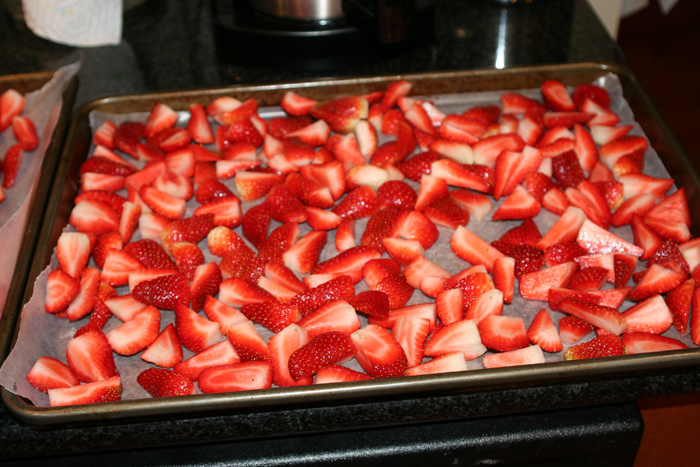 Next, I washed all the strawberries, cut them and put them on this cookie sheet lined with wax paper. I froze them for about 1-2 hours and then put into a large freezer bag, so I can scoop them out as I need them. I have learned to set a timer so I don’t forget about them in the freezer and a week later have dried out fruit! I peeled and cut the bananas and put them on a wax paper lined cookie sheet. I froze these overnight (because I forgot about them!) 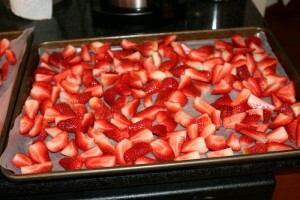 and then put into large freezer bags to scoop out for smoothies. 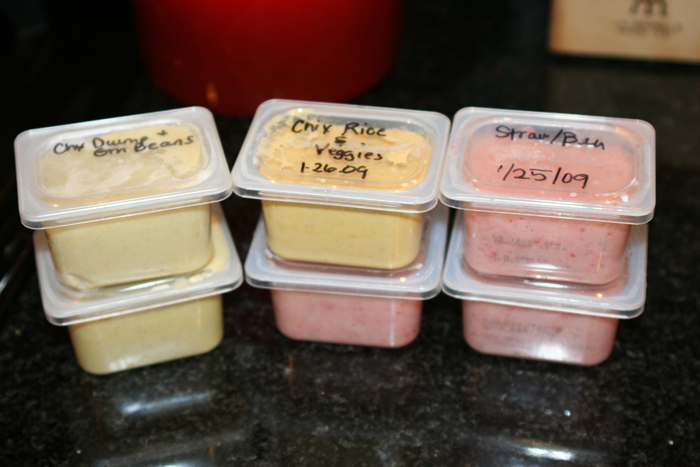 While I had all the fruit out, I went ahead and made up a few baby food servings. 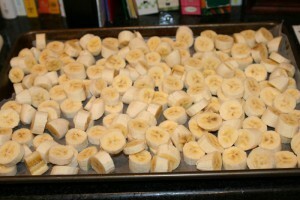 I mixed the bananas, a little strawberry and some apple juice in the Magic Bullet and got a few fruit servings. Then I took leftovers in the fridge: chicken, rice, green beans and jar of baby food he didnt’ like – I mixed these together too. I got 6 new baby food meals! I think I am done buying baby food at the store, yeah! 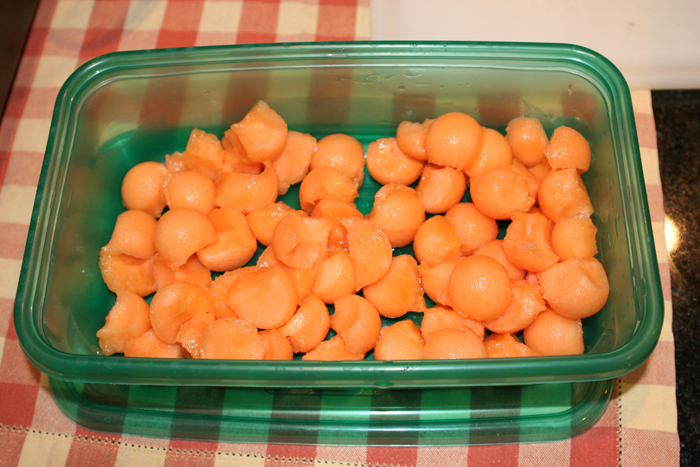 Lastly, I cleaned out my cantelope and used a melon ball scooper and put them into a ziploc container. 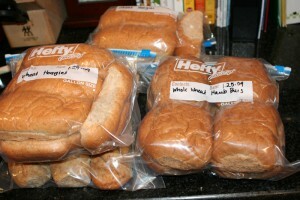 For more inspiration, check out Money Saving Mom’s series on her “Baking Day” here. 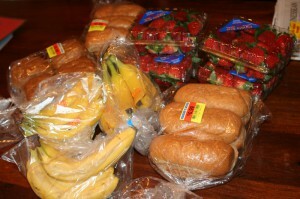 So what are you prepping or storing this week? I’d love to see any prepping or baking you’ve been doing at your house today! 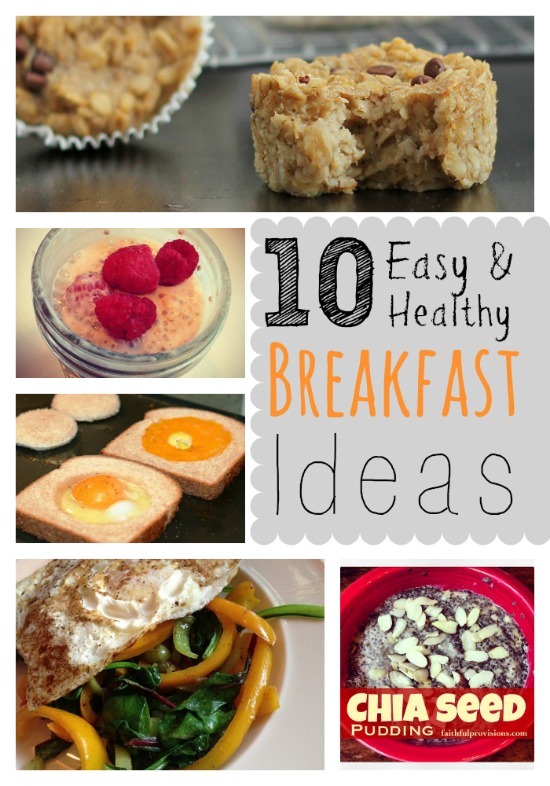 If you’ve blogged about it, post your link or links below so we can all be inspired and motivated (and probably pick up some new ideas and recipes, too!). Thanks for joining me. It’s always so much more fun to have you all following along!